Keen to understand the range of economic issues that affect our daily lives and develop his analytical and communication skills, Louis Franklin-Pugh chose LSBU due to its diverse international student base and central London location. “I was also very impressed by the high quality of the academic staff, their proactive involvement in each individual’s performance and the wide range of opportunities offered to students such as the Institute of Director’s membership,” he says. Alongside the skills he developed, Louis also had the valuable opportunity to put these into practice, as well as taking part in University-based extra-curricular projects. “I carried out an operations placement at Cherry Tree Wales, which included successfully managing all stock for the Cardiff Bay Food Festival and using the stock management system to track and order the appropriate amount of merchandise needed. I also effectively arranged the transport of stock to the festival and ensured all unused stock was returned and reviewed to accurately plan for the next food festival." "I really enjoyed being part of the LSBU annual student telephone fundraiser, working as part of a team raising donations from and offering services to the alumni of the University whilst updating their contact details. Activities such as this are great fun but also a chance to get involved with things and develop some of the softer skills needed. 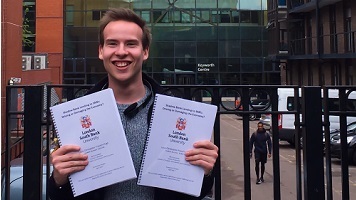 Louis is currently interviewing for roles involving risk management, an area he wishes to pursue due to his interest in analysing factors that contribute to risk; an interest developed from conducting his own research during Econometric modules. “I am both interested in corporate and financial risk management, and feel the skills I developed will be useful in this role. Throughout my undergraduate degree, I developed strong communication skills and demonstrated my problem-solving abilities." "I participated in the University Hackathon, where we had to create a presentation to advise an SME on how to attract more clients, improve their website and social media – and I won first prize!" The Hackathon (an LSBU annual event) takes a real-life case study and asks students to analyse a business and suggest solutions to their development challenges. The company was called Code + Wander, a media company that incorporates travel – a start-up company co-founded by enterprising LSBU alumnus Chris Underdown. “I advised Code + Wander to use their existing clients to progress their business and suggested smaller events that they could hold to increase awareness. We also advised them on improving their social media and suggesting gathering testimonials." "Also, right from the start of my degree, in my Macro and Microeconomics modules, I was consistently given problems to solve for coursework and exams. Additionally, the degree equipped me with strong analytical skills, a detail-orientated methodical approach to all tasks and a critical mind, all of which are fundamental attributes of anyone starting their career. In several modules, I was required to analyse and explain complex data and present the findings of my research to an audience. As Louis reflects on his own time at LSBU, what advice would he give to anyone considering the University for their own studies? “I would simply say, do it! I had the best experience at LSBU and have learnt so much here. I have met so many different people and have had the best time living in London whilst studying. I put a lot of hard work into my degree and with the help of my lecturers and a lot of reading, it was all worth it! “The education side was amazing, with all of the lectures well planned and informative. I also always felt prepared to complete coursework or my exams. I liked the range of teaching that the degree gave, so that, as well as economics, I learnt business skills, communication skills, quantitative skills and about marketing and corporate communication. "Dr Peter Luke and Christina Anderl make a great economics team and were always there to support all of us through our work. I always enjoyed living in London and, although the student life is different than most universities outside of the capital, it definitely prepares you for life after university."